All prices exclude UK duty & VAT and all wines are offered subject to remaining unsold. E&OE. The 2015 Canon was a benchmark wine that seemed to revitalize this historic estate. I was crossing my fingers that it would not disappoint in bottle and I am glad to say that it delivers the goods. It has a very intense bouquet (just as it showed out of barrel) with laser-like precision offering wild strawberry, raspberry preserve, wet limestone and hints of truffle. The palate is medium-bodied with supple tannin, clean and fresh with pure black and red fruit whose every atom appears infused with minerals. The mouth is tingling long after the wine has exited and your brain is thinking...when is the next sip coming? 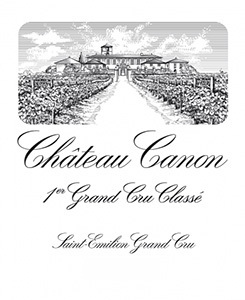 It is frankly heads and shoulders above almost every Saint Émilion this vintage, to reaffirm, a benchmark for this historic estate that will give pleasure to many over the coming years. Astonishing. Anticipated maturity: 2021 - 2050. Seductive. The nose draws you in deep: It’s like staring into a well of pristine dark cherries, dark plums, blackberries and mulberries. All the oak is perfectly subsumed. The palate’s flawless with immense depth and power and it’s so balanced as to appear to float. Immaculate fresh dark-berry and plum flavors. Silky and deep, ribbon-like finish. Perfect. Best from 2022. This is the greatest red ever produced here, even better than the great wines of the 1950s and 1960s. Full body yet tight and reserved. Superbly refined tannins. Yet rich and flamboyant. Fruity yet salty and minerally. Electric finish. Stone and chalk undertones. A wonder of a young wine. The 2015 Canon is one of the undisputed stars of the vintage. An utterly mesmerizing wine, Canon has it all; alluring aromatics; towering structure, fabulous depth, and exceptional balance. The aromas and flavors are remarkably nuanced for such a big wine. Waves of graphite, exotic spices, smoke, herb, licorice, violets and crème de cassis appear at every angle as this utterly profound Saint-Émilion shows off its pedigree. So far I have tasted the 2015 four times. It has never been anything less than sensational. Quite simply, Canon is one of the few truly must-have wines of 2015. It is every bit that memorable. Tasted blind. Interesting broad, leafy notes on the nose. Lots of energy and richness. Real depth and excitement. Long and such a pace in the wine. Smooth and sweet and charming. Tannins well hidden. They picked relatively early here. Very bright, deep crimson. Again, like the 2016, really savoury and appetising on the nose (not too sweet compared with Ch Canon La Gaffelière). Smooth and much sweeter on the palate. Fruit battling the considerable tannins. Masses buried in here. So juicy and alluring! Hint of pencil-shavings flavour (the Cabernet Franc?) but not the pencil-shavings texture which can be awkward. A triumph. Sample 1, from a new Taransaud barrique: Very dark crimson. Very complete and juicy on the nose. Very rich and glorious! Luscious and spicy. Deep and rich. Quite savoury and structured. Very fine and tight. Dry finish. Not as much fun to taste in isolation. Doubtless a useful ingredient. Slightly drying end. Sample 2, from a new St Martin barrique: Very dark crimson. Very sweet and floral on the nose. Ripe and round. Lots to enjoy here! Real lift and very sophisticated. So long! Sample 3: And finally an official sample at the château: strong hint of iodine on the nose. Very luscious and supple at first and then with massive velvety tannins and almost dried-fruit sweetness and concentration. Bravo! There has been huge investment here recently in the vineyard (which is planted 75% Merlot, 25% Cabernet Franc) and chai by owners Chanel. The Chateau itself has recently enjoyed a substantial make-over. This is a great property that made fabulous wines in the past but dipped in form during the 1990's. It is now right back up there as one of the very best of all the Saint Emilion Chateaux. New director Nicolas Audebert has come in from Krug via South America. The 2015 blend is 72% Merlot, 28% Cabernet Franc. Deep purple colour. Violets, blueberries and cherries on this incredibly lifted and aromatic notes. The palate is fresh with acidity but intense with incredibly vibrant blue and black fruits. The tannins are silky smooth and very refined, drawing out a graphite mineral edge which balances superbly with the sweet vanilla and lightly smoky notes from the new oak. This has a long and well-defined, elegant finish. A really superb wine again this year, which defines the balanced, lifted style of St Emilion that we love at Farr Vintners. the flamboyance of many and remains true to its terroir.